Six times throughout the school year, KPBSD school days will end ninety minutes early for students, in order for teachers and instructional support staff to collaborate. Six times throughout the academic year, students will meet the minimum day requirement, leaving teachers with approximately ninety minutes of additional time to work on improvement strategies. 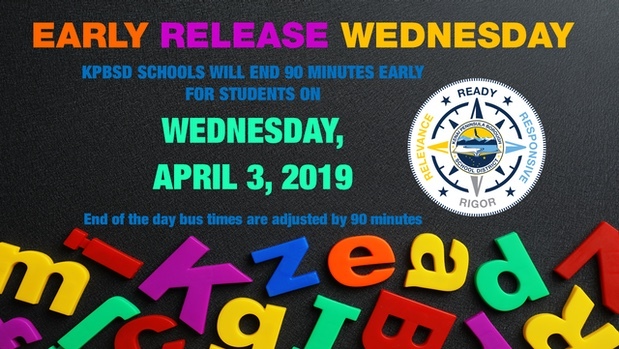 The length of the school day on the following six days will be reduced by ninety minutes, for a total of nine hours during the 2018-2019 school year. On these early release dates, school will end ninety minutes (1.5 hours) earlier. Bus transportation will be adjusted by ninety minutes. We recognize families may need to make arrangements on the early release dates, and thank everyone for the willingness to help our KPBSD schools improve through these six early-release dates. Please contact your school principal with questions.